In that respect, it made total sense to me to travel to London and to attend HashiDays. 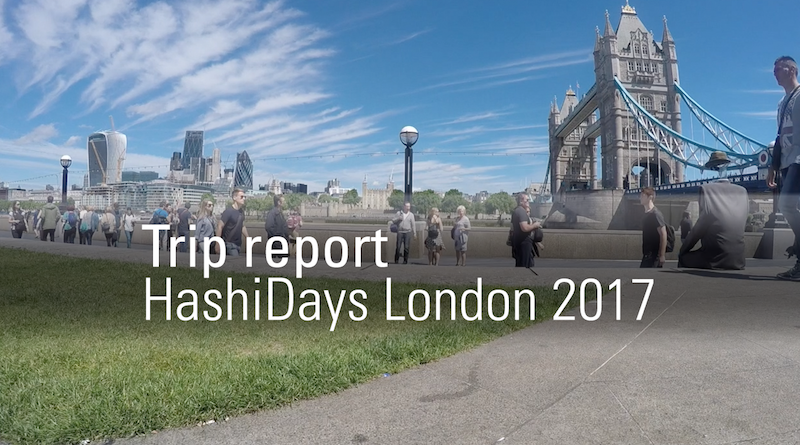 As usual, I made a trip report where I mix business and pleasure: the London sights and the HashiDays London 2017 vibes. The “Hashi” in HashiDays and HashiCorp comes from the lastname of the founder: Mitchell Hashimoto. The first talk we saw when entering the venue, was Mitchell’s keynote. It gave us a view on the current state and the future of the HashiCorp open source tools and the enterprise options they offer. The other HashiCorp co-founder, Armon Dadgar, also gave a talk. His presentation was all about their latest tool: Nomad. There were plenty more other talk I enjoyed. More specifically: the multi-cloud Terraform demo by Paddy Foran and the Terraform talk by Nicki Watt. HashiDays was great! I learned a lot and got the opportunity to ask some questions to Mitchell and his crew. Keep up the good work, Mitchell, you’re doing it right!